Bronze bust tribute to Nikola Tesla, world renown scientist of Serbian origin, that was installed this April in the Electric Power Historical Museum TEPCO in Yokohama, Kanagawa Prefecture, was officially revealed on June 28th. The project was successfully accomplished based on collaboration between members of the Group of Support of Tesla's Deeds, TEPCO Museum, Embassy of Japan in Belgrade, Association for Cooperation Japan - Serbia, many other enthusiastic people, who contributed to this project, and our Embassy. This is the first statue of Nikola Tesla in Japan, aiming to raise more awarness of his work and achievements in Japanese public. 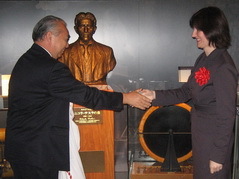 For their efforts in promoting not only Tesla’s contributions to modern society, but also friendly relations between Serbia and Japan, the Group of Support of Tesla's Deeds and TEPCO Museum were awarded with the Acknowledgment plaques by both embassies of Serbia and Japan respectfully. After the revelation of the statue by Charge d’Affaires a.i. Mrs. S.Janković and H.E.Mr. 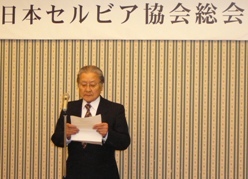 T.Nagai, who also delivered the speeches along with other organizers, the visitors had the opportunity to hear more about the project and Tesla’s accomplishments in the presentation by Mr. O.Hirashita, the founder of the Group of Support of Tesla's Deeds, and lecture by Mr. M.Shindo, authors of several books on Tesla and the representative of Tesla’s Institute in Japan. For this unique occasion, the guests were presented with a commemorative stamps with Tesla’s character and a Serbian banknote with Tesla’s image. 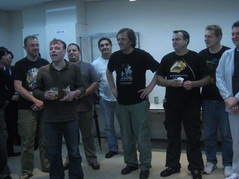 After 20 years of sell-out tours throughout Europe and South America, Japanese audence was finally able to witness the great talent of world famous filmmaker Emir Kusturica ("Underground", "Life is a miracle") & "The No Smoking Orchestra" on June 26th in Tokyo JCB Hall. 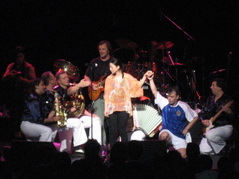 This very successful and vibrant event, organized by Conversation & Company Ltd. (link na http://www.conversation.co.jp/schedule/ek_tnso/) with the support of our Embassy, introduced some of the well-known compositions from Kusturica’s movies and songs by The No Smoking Orchestra. More than 3000 people in the audence, some of which stars themselves like Tadanobu Asano, cheered, danced and sang along the tunes. With his fantastic performance and energy, Dr.Nele Karajlić, the lead singer and one of the great rock stars in former Yugoslavia, contributed greatly to the heating atmosphere among fans in JCB Hall. For further information on “The No Smoking Orchestra” and their concerts’ schedule, please visit http://www.thenosmokingorchestra.com/index.php. In celebration of the International Refugee Day on June 20th, NGO "Joint Network of International Volunteers" (JNIV), focused on humanitarian support towards refugees and internally displaced persons in Serbia and former Yugoslavia, organized a photo exhibition 残る傷跡・未来への笑顔 in Orange Gallery in Shinjuku, June 21 - 22. The exhibited works by volunteers of JNIV showed the atmosphere and situation in refugee camps in former Yugoslavia and is a part of greater effort of JNIV to raise the awarness in Japanese public about refugee issues from this region. As a part of the programme of the 64th National Convention of UNESCO Federation in Tokyo (June 7-8), 15 countries from around the world, including Serbia, participated in the event "Wai Wai Hiroba", organized in "Meguro Persimmon Hall". 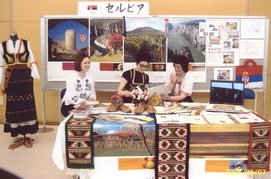 The visitors of Serbian booth had the opportunity to learn more about popular tourist destinations, national cuisine and costumes, natural beauties, history and cultural heritage of our country, and to buy goods from Serbian Naive Art Exhibition in Hiroshima prefecture and commemorative envelopes issued for the occasion of 125 anniversary of Serbian - Japanese relations. Serbian presentation was a product of collaboration between our Embassy, Japan - Serbia Exchange Association and Serbian students in Japan. Japanese nongovernmental organization "Actions for Children in Crisis" (ACC), which has been actively involved in humanitarian programmes for orphans, elderly and refugees in Serbia and South East Asia, organized seasonal Charity Bazaar on Sunday, June 8th in their Tokyo headquarters. 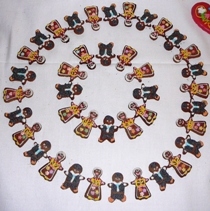 Among various exhibits, the visitors were welcomed to purchase some of hand made products created by internally displaced persons from Serbian province of Kosovo and Metohija, during collaboration workshops of ACC with sister organization from Belgrade "Hi Neghbour". The proceeds from the Bazaar will be used for financing ACC activities and development of their humanitarian programmes. On invitation by the Radio NHK, Ms. Aleksandra Kovač, Head of Cultural Affairs Section, participated in a NHK radio talk show "Taishikan kara Konnichiwa" on June 6th, 2008. During the half an hour programme in Japanese, Ms. Kovač talked about her interests in Japan, as well as about Serbia's cultural and historical heritage and popular tourist attractions. Recent successes of Serbian volleyball national team in Japan and tennis players in international tournaments also raised a lot of interests during the show. 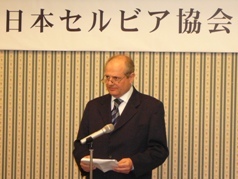 Serbian - Japanese Friendship Association "St. Nikolaj Japanski" from Kyoto is planning to invite Mr. Branko Manojlović, guest lecturer at Doshisha University in Kyoto from London, to give a lecture on June 21st, about Serbia. This lecture is a part of ongoing programme, initiated and organized by friendship association, aimed to provide more useful informations about Serbia and introduce its culture, history etc. The events are organized twice a month, every first and third Saturday, in the premises of "Kyoto International Community House"
After successful opening in Kyushu in April, the exhibition of 76 artworks by 35 naive painters from the collection of International Ethno Center Babka Kovačica moved to Onomichi City Art Museum in Hiroshima Prefecture (May 24 - June 15, 2008). This is a third installation of Serbian naive art in Japan, organized by Ethno Center Babka and Association for Cooperation Japan - Serbia, with the support of the Japanese institutions and organizations (UNESCO Associations from Tokyo and Hiroshima city, NHK, regional Board of Education) and Serbian institutions (Government of Serbia, Ministry of Culture of Serbia, Ministry of Foreign Affairs of Serbia and this Embassy). For this occasion, Mr. Pavel Babka, director of International Ethno Center from Kovačica, held two lectures on development and challenges of Serbian naive painting in the Onomichi City Art Museum, which were visited by not only Japanese audience, but also Serbian students from Kobe, Himeji and Okayama. Like in previous installations, apart from Naive Art Paintings, the visitors have the opportunity to see Serbian traditional costumes, short documentary about painters in Kovačica village, short movies by renowed Serbian filmmaker, Petar Lalovic, and to purchase some of the hand-crafted works from Serbia. The closing exhibition of Serbian naive art in Japan will be organized in Tama Art University Museum in Tokyo (July 27 - September 14, 2008). During May, we have hosted many students from various prefectures and regions in Japan like Hyogo, Gifu, Aichi, Osaka, Wakayama, Yamagata and Miyagi. It was real pleasure to meet with young Japanese generation and to not only talk with them about Serbian history, natural beauties and culture, but also to exchange opinions about current environmental and social issues in Serbia and Japan. We were moved by students' effort to learn more about Serbia and we hope our enjoyable and fun time spent together will contribute more to the future cultural and educational exchange between our two countries. On the last day of their touring in Japan, 25 members of Serbia's oldest folklore dance group delivered dinamic and passionate performance in front of numerous audience in Chiba Culture Civic Center. Their repetoire included dances and songs from various Serbian regions, including provinces of Vojvodina and Kosovo-Metohija, and the central part known as Šumadija. 1. 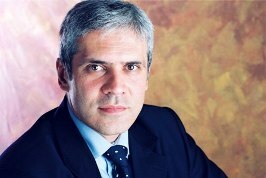 For a European Serbia Boris Tadic 1,590,200 votes (38.4 percent) 102 seats. 2. Liberal Democratic Party Cedomir Jovanovic 216,902 votes (5.24 percent) 13 seats. 3. 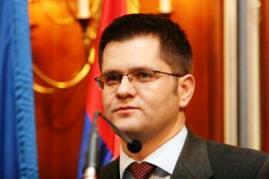 Democratic Party of Serbia New Serbia Vojislav Kostunica 480,987 (11.61 percent) 30 seats. 4. Serbian Radical Party Dr Vojislav Seselj 1,219,436 votes (29.45 percent) 78 seats. 5. Socialist Party of Serbia Party of United Pensioners of Serbia United Serbia 313,896 (7.58 percent) 20 seats. 6. 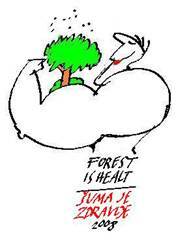 Bosniak Ticket for a European Sandzak Dr Sulejman Ugljanin 38,148 (0.92 votes) 2 seats. 7. Hungarian Coalition Istvan Pastor 74,874 votes (1.81 percent) 4 seats. 17. Coalition of Albanians of Presevo Valley 16,801 votes (0.41 percent) 1 seat. "Karadzic", the oldest folk dance group from Loznica city in Serbia, named after renowned Serbian scholar from 19 century, is touring in Japan for the first time. Its 25 members, consisting of dancers, singers and musicians, had the opportunity to perform at this year's Rose Festival in Fukuyama city, Hiroshima Prefecture on May 18th. They also visited local school and center for elderly, showing their entertainment skills and introducing Serbian culture. On May 19th, they stopped by our Embassy, where we all talked about their impressions about Japan and experiences from their stay. 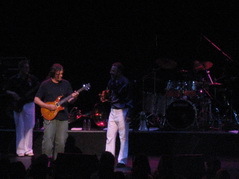 They will have two more concerts in Japan - in Ibaraki Prefecture (Koga City) on May 20th and Chiba Prefecture (Chiba City) on May 21st, 2008. Season of high school study trips to the foreign embassies in Tokyo has started! This time, we had the opportunity to meet nine students from Junior High School in Sendai, Miyagi prefecture and to present some interesting facts about Serbian culture, customs and history. 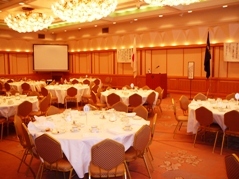 Upon the invitation of the Gunma Prefectural Women's University, Charge d'Affaires a.i. of the Embassy of Serbia in Japan Mrs. Snezana Jankovic gave lecture about Serbia to the students of the University and citizens of the Takasaki City. This is the second presentation of Serbia at this university, previously being done in October 2007. 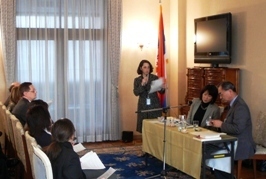 Along with the presentation of natural and tourist attractions of Serbia, Mrs. Jankovic presented the priority issues in Serbian internal and foreign policy, results of the ongoing economic reforms, Serbian activities and initiatives in the international arena, as well as its bilateral relations with Japan. She also explained to the auditorium the history of the Kosovo problem and the negative consequences of the unilaterally proclaimed independence of the southern Serbian province. 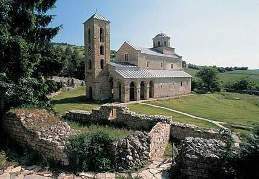 UNESCO World Heritage monument from XIII century, Sopoćani Monastery, was featured in the online article in Japanese web magazine Kersol. Natural beauty surrounding this solemn place was also presented in the article. The author is Japanese designer Fumio Matsui. To read the article (in Japanese), please click here. This magazine, whose topics range from leisure to business and art, also introduced two major Serbian cities in its prevous article. To see it, please go here. 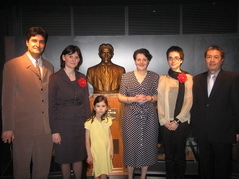 At the invitation of the Radio NHK, Mrs. Snezana Janković, Charge d'Affaires a. i. participated in the programme "Watashino sukina Nippon" on April 29, 2008. During an hour programme in Japanese, Mrs. Janković talked about Japanese culture and her interest in Japan, as well as about bilateral relations between Serbia and Japan, Serbia's cultural heritage and tourist attractions. Kersol, Japanese web magazine featuring various topics - from food, travel to business and art, issued an online article about famous music festival in Serbia "EXIT" and atmosphere in cities like Novi Sad and Belgrade. The author is Japanese designer Ai Ohara. On April 21, the statue of Nikola Tesla, world renown scientist of Serbian origin, along with the replica of his AC motor, were installed in the Electric Power Historical Museum TEPCO in Kawasaki city. 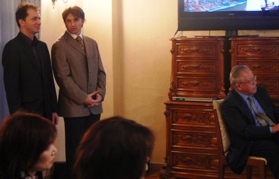 This project was initiated by Mr. Osamu Hirashita from "Japan Planning Systems", who was enchanted by Tesla's achievements, exhibited in "Nikola Tesla Museum" in Belgrade (http://www.tesla-museum.org/), during his trip to Serbia. Mr. Hirashita and his associates, with the support of our Embassy, Association for Cooperation Japan - Serbia and many others, succedeed in their efforts to finalize this project, which is meant to raise more awarness of Tesla's work in Japan. Link to the Museum http://www.tepco.co.jp/shiryokan/home-j.html. Mr. Branislav Kapetanović, Serbian cluster bomb victim and firm advocate of total ban of use of cluster bombs, visited Japan as a participant of anti-cluster campaign and related simposium, organized by NGO "Japan Campaign to Ban Landmines" (JCBL). During his 10-day stay, Kapetanović engaged actively in raising awareness of the dangers of this "inhumane weapon", through various lectures, interviews and meetings with not only Japanese citizens, but also government officials from Ministry of Defense, MOFA and Parliament. 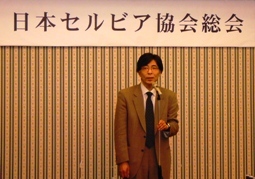 Kapetanović, also a spokesman of NGO "Cluster Munitions Coalition", urged Japanese government to join an international bid to totally ban cluster bombs, stressing that 95% of its victims are civilians. On Friday 18th, Kapetanović and the representatives of JCBL visited our Embassy, where we had the opportunity to hear more about their efforts in promoting anti-cluster actions. As a country aware of humanitarian problems caused by this munition, from its own experience, Serbia is supporting international initiative "Oslo Process" aiming for total banning and hosted Belgrade Conference of States Affected by Cluster Munitions in October 2007. Prof. Dr Dijana Marković Bajalović, President of the Council of the Commission for Protection of Competition of the Republic of Serbia, and Prof. Dr Radovan Vukadinović, Member of Council, were among more than a hundred participants from their respective countries at the Seventh Annual Conference of International Competition Network (ICN), hosted by the Japan Fair Trade Commission in Kyoto, April 14 - 16. During their visit to Japan, Serbian delegation had also the opportunity to meet with the Embassy representatives in Tokyo. Pursuant to the current Serbian Law on Protection of Competition (came into force on September 23, 2006), Commission for Protection of Competition has been set up as an independent and autonomous authority performing public legal competencies, in line with the Law, in the capacity of legal entity, located in Beograd and responsible for its activities to the National Parliament. The Commission consists of the Council of the Commission and Technical Service of the Commission. For more information about Serbian Competition Commission, please click here. The exhibition of 76 artworks by 35 naive painters from the collection of International Ethno Center Babka Kovačica was opened in the Oita Prefectural Art Hall in Kyushu. This second installation of Serbian naive art was organized by Oita Godo Shimbun and Association for Cooperation Japan - Serbia, with the support of the Government of Serbia, Ministry of Culture of Serbia, Ministry of Foreign Affairs of Serbia and this Embassy. 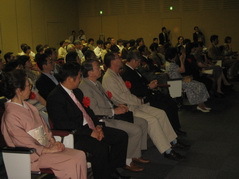 During the official openning event, the representatives of Oita Godo Shimbun and Oita Prefectural Art Hall addressed the auditorium, followed by the speeches of Mr. Takehiro Togo, President of Association for Cooperation Japan-Serbia, and Ms. Aleksandra Kovač, Deputy for Cultural Affairs. 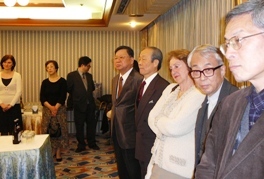 Honorary Consul General of Serbia in Osaka, Mr. Naohide Ueyama, representatives of prefectural governmental and cultural institutions, media, art associations and universities were present at the opening, among more than hundred guests. Apart from Naive Art Paintings, the visitors will have opportunity to see short documentary about painters in Kovačica village and short movies by renowed Serbian filmmaker, Petar Lalovic, and to purchase some of the hand-crafted works from Serbia. The remaining two exhibitions of Serbian naive paintings in Japan will be organized in Onomichi City Art Museum in Hiroshima Prefecture (May 24 - June 15, 2008) and Tama Art University Museum in Tokyo (July 27 - September 14, 2008). 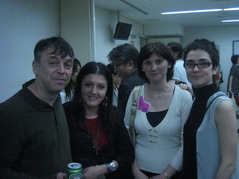 The first of two of exhibitions by Serbian and Japanese visual artists was opened in Gallery ZAIM in Yokohama on April 5th, 2008. Ms. Akikawa, organizer and head of NPO "Japan Yugo Art Project", and Mrs. Jankovic, Charge d'Affairs a.i., also delivered speeches, greeting this valuable opportunity for nurturing and strenghtening mutual understanding and collaboration between two cultures and their art scenes. This time the organizers presented works of seven contemporary Serbian visual artists – Mr. Nebojsa Babic, Mr. Ivan Petrovic, Mr. Ivan Zupanc, Ms. Jelena Radic, Mr. Aleksandar Kujuncev, Ms. Milica Ruzicic and Ms. Jelena Culafic - some of which had been showing their artworks to Japanese public before. The works by esteemed Serbian film makers Petar Lalović and Oliver Fojkar, who participated at the last year's "International Wildlife Film Festival" in Toyama, will also be shown during the event. All interested in participating in International Cartoon Festival, taking place this year in Vučje, Serbia, can see here for the requirements, deadlines and contact details. Serbian Naive Art again in Japan! The Exhibition of Serbian Naive Art from Kovačica, that made a successful debut in Tokyo City Art Museum, will be visiting Japan again this sping and summer. Planned venues: Oita Prefectural Art Hall in Kyushu (15.04-11.05.2008), Onomichi City Art Museum in Hiroshima (May 05 - June 15, 2008) and Tama Art University Museum (July 27 - September 14, 2008). For Oita exhibition, please visit following link: http://geijutukaikan-b.oita-ed.jp/exhibition/schedule.html. "West Japan Folkdance Association" from Fukuyama City in Hiroshima will be organizing the concert of traditional Serbian dance in several cities in Japan. Serbian folkdance company "Karadžić" from Loznica will participate at Fukuyama's Rose festival and then will be guests in prefectures Ibaraki and Chiba (18-21.05.). Collaboration with Japanese counterparts, brought several Serbian visual artists to Japan, where they will show to Japanese public their artwork. The event was organized by Japanese non-profit organization "Japan Yugo Art Project" in Tokyo (Gallery Huit) and Yokohama (Gallery ZAIM) under the name "Za sutra" (For tomorrow). Tokyo exhibition will be from April 09-22, and in Yokohama from April 5-15. The organizers are planning also to show some works by esteemed Serbian film makers Petar Lalović and Oliver Fojkar, who participated at the last year's "International Wildlife Film Festival" in Toyama, when Mr. Lalović was a jury member and Mr. Fojkar winner of Children Film Award. Mr. Lalović's work was recently shown at the Mainichi Shimbun screening, as a part of a series of nature related foreign films. Natalija Ribović, young multimedia artist of Serbian origin, residing in Japan, was given a great opportunity to show her interesting work through her exhibition "Octo Hasi Balkan Picnic" as a part of "Emerging Artists Program 2007" in the gallery of Tokyo Wonder Site - Hongo. Velimir Vukićević, artist and professor at the University of Arts in Belgrade, who participated last summer at the Seto International Ceramic & Glass Art Exchange Program 2007-2008, will exhibit his works, along with other participants at the group exhibition in the Seto City Art Museum, Aichi Prefecture. The exhibition is opened until April 13th and the details can also be seen at the following web site: www.seto-cul.jp/program.htm. Serbian children awarded at "The 15th Annual World Children's Picture Contest"
Among more than 50,000 applicants from 67 countries, five Serbian children – Jovana Stankov, Jovana Mitrović, Jovana Vladimir Kreculj, Kristina Jugoslav Stošić and Katarina Štrbac - were awarded for their picture at this event organized by charitable organization IE-NO-HIKARI Association. Last year, as well, several Serbian pictures won prizes (for details, please click here). Embassy representative, Ms. Aleksandra Kovač, attended the award ceremony. 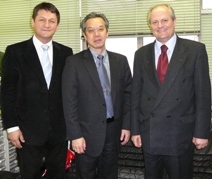 One of the leading Serbian surgeons and distinguished member of the world most prestigious medical associations, Prof. Dr. Zoran Krivokapic from the First Surgical Clinic of the Clinical Center of Serbia, held talks with the most prominent specialists for malignant diseases during his one week visit to Japan. Prof. Krivokapic exchanged views about the latest results in the cancer treatment with Prof. Dr. K. Sugihara of the Tokyo Medical and Dental University Hospital, Prof. Dr T. Muto, Director if the Institute for Cancer and Prof. Dr. Y. Moriya, from the National Cancer Center. There were also talks about the modalities of the future cooperation between the medical institutions of Serbia and Japan. 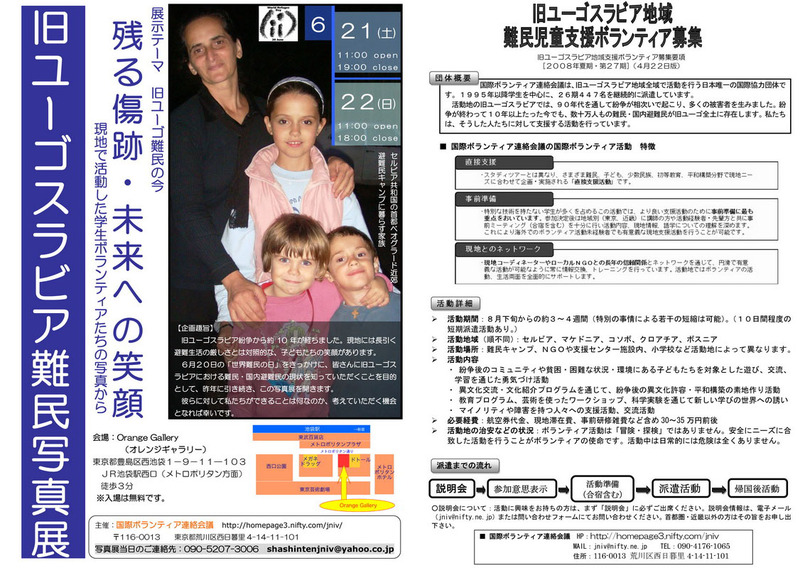 Following the decision of the Japanese Government to recognize the unilaterally proclaimed independence of the so called "Republic of Kosovo" by the Albanian secessionist minority in the southern Serbian province, Ambassador of Serbia to Japan H. E. Mr. Ivan Mrkic handed in to the Ministry of Foreign Affairs a protest note against this decision of the Government of Japan. 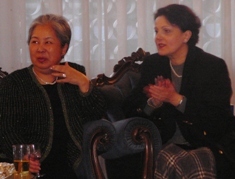 In accordance with the Action Plan adopted by the Serbian government, Ambassador Mrkic was instructed to return to Serbia for consultations as of March 20, 2008. 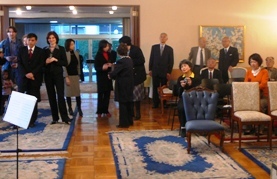 In a meeting at the National Diet of Japan, Ambassador of Serbia H. E. Mr. Ivan Mrkic and the President of the House of Counselors, The Honorable Mr. Satsuki Eda, exchanged views about the situation following the unilaterally proclaimed independence by the Albanian minority living in the southern Serbian Province of Kosovo and Metohija. 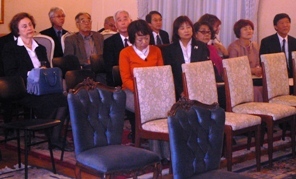 Mrs. Akiko Santo, Vice President of the House of Councilors was also present at the meeting. Ambassador Mrkic explained Serbian position regarding the illegal act of the unilateral proclamation of independence, which represents flagrant violation of the Charter of the United Nations, resolutions of the Security council, Helsinki Final Act and the international law. President Eda expressed his hope that the situation will not bring destabilization to the region and that peace will be preserved. Among more than 200 exhibitiors from 63 countries at the biggest International Food and Beverage Exhibition in Asia FOODEX JAPAN 2008, held from March 11-14 in Makuhari Messe, Serbia opened its first stand. 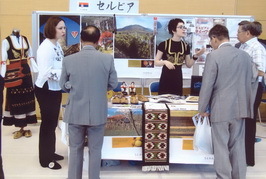 Six Serbian companies ("Sicoberry", "IGDA Impex", "Malina Produkt", "ITN Belgrade", "Sirogojno Company" and "Wine Cellar Jelić"), with the support of Serbian Investment and Export Promotion Agency (SIEPA) and this Embassy, succesfully presented their products to Japanese and foreign visitors. On this occasion, Ambassador Mrkić, as the only representitave from South East Europe, was one of the special guests at the opening ceremony, where speeches were made by Japanese Minister of Agriculture Masahiro Imamura and Polish Minister of Agriculture Marek Savicki. On the second day of the fair, a seminar was held to introduce Serbian stand and companies. Special guest at the seminar, Mr. Komei Nakajima, former JICA expert for foreign investments in Serbia, spoke about the advantages of domestic programme of healthy food and organic fruit and vegetable production in Serbia. 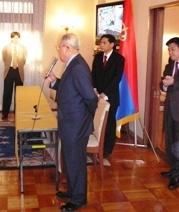 He also highlighted good conditions for establishing cooperation between Japanese and Serbian companies, like continuous efforts of Serbian government to introduce legal framework in accordance with EU standards, the fact that Serbia is a country with the lowest percentage of pesticide use in Europe and one of the biggest producers of raspberries in the world, etc. The Embassy of Serbia in Tokyo organized a cocktail party in honor of the representatives of the Serbian Investment and Export Promotion Agency (SIEPA) and companies participating in the 33rd International Food and Beverage Exhibition, Foodex Japan 2008, being held from March 11 to 14 in Makuhari Messe. Representatives of Serbian exporters of healthy and organic food, like Malina produkt, Sirogojno Company, Igda Impex, Vineyards and vine cells Jelic, ITN Belgrade etc. had the opportunity to discuss with Japanese guests and partners from Japanese food and beverage business about the possibilities for expanding present and establish future cooperation. Continuous participation in Foodex Japan manifests Serbian companies' interest and eagerness to present their highest quality products at this largest food and beverage exhibition in Asia. 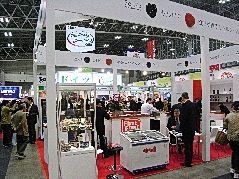 More information about Foodex Japan 2008, in English and Japanese, is available at the SIEPA web site. Upon the invitation of the President of the Japan-Serbia Association, Prof. Dr. Shosaku Tokunaga, Ambassador of Serbia to Japan, H.E. 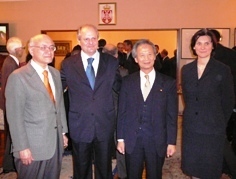 Mr. Ivan Mrkic and his associates took part in the Annual Assembly and reception of the Japan - Serbia Association. In his speech, Ambassador Mrkic praised the efforts of this association, which was established more than half a century ago, towards enhancement of stronger and closer bilateral ties between the two countries and their people. He expressed Serbia's appreciation and respect to the prominent members of the Association, whose work contributed to better mutual understanding and cooperation between Serbia and Japan. Serbian Ambassador also explained to the guests the situation after the unilaterally proclaimed independence by the Albanian minority in the Serbian Province of Kosovo and Metohija, emphasizing Serbian efforts to bring Kosovo back under its sovereignty by exerting all diplomatic and legal means. President of the Association Dr. Tokunaga expressed understanding and solidarity with Serbian position regarding Kosovo and Metohija. He announced the plan for future activities, including publishing the History of the Association and its ties with Serbia. 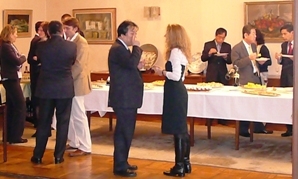 The Fourth Annual assembly and reception of the Japan - Serbia Exchange Association were held at the Embassy's premises on March 5, 2008. President of the Association, H.E. 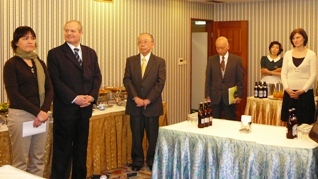 Dr. Takehiro Togo, President of the Board Mr. Kenzo Yoneda, as well as ambassador of Serbia to Japan, H.E. Mr. Ivan Mrkic, greeted the guests. President Togo and President of the Board Yoneda reported to the members about the successful activities of the Association in the previous year. They also explained to the guests the problem of the unilaterally proclaimed independence by ethnic Albanian minority in Kosovo, southern province of Serbia. 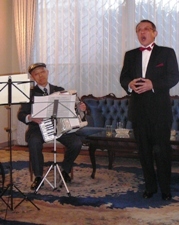 During the reception organized after the annual meeting, Japanese musicians performed traditional Serbian and classical music. 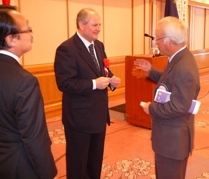 Ambassador of Serbia to Japan, H.E. 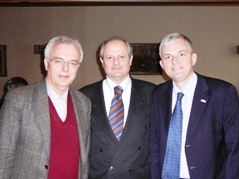 Mr. Ivan Mrkic, gave a lecture and video presentation about Serbia and its relations with Japan to the members of the Rotary club "Tokyo - North", (H.I.H. 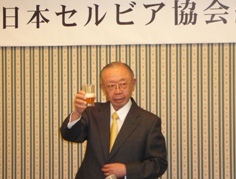 Prince Mikasa is the Honorary President). Ambassador Mrkic informed the guests about the 126 years long tradition of official relations between Serbia and Japan, as well as about the potentials for their further development, especially in the economic sector. Serbian ambassador also has extensively explained the roots, historical background, causes and consequences of the unilaterally proclaimed independence by the separatist Albanian minority in the southern Serbian Province of Kosovo and Metohija. The international system that has brought unprecedented prosperity to the world since 1945 is based on rules that apply without exception. This system is supposed to protect the basic, legitimate national interests of every country, whether rich or poor, strong or weak. Its binding principles include the sovereign equality of states, the respect for the territorial integrity and the inviolability of internationally recognized borders. Yet on Feb. 17, the Serbian province of Kosovo, which has been under United Nations administration since 1999, unilaterally declared independence from my country. This illegal act has, unfortunately, been recognized by the Bush administration and some European countries including Britain, France and Germany. Others in Europe – including Greece, Romania and Spain – have withheld recognition, as have most other leading global and regional players, including Brazil, China, Egypt, India, Israel, Russia and South Africa. As things stand, the number of countries that will recognize an independent Kosovo will plateau at around 40, leaving it unrecognized by a vast majority of the close to 200 members of the United Nations. This includes, of course, The Republic of Serbia. A peaceful demonstration of close to half a million people in Belgrade last week condemned this act of illegal secession. Unfortunately, a few hundred hooligans attacked several embassies, including that of the United States, and looted stores; they even attacked my ministry. Our government has condemned these acts, and will prosecute the offenders. The case against recognition is based not only on the Security Council's 1999 resolution reaffirming Serbia's sovereignty over Kosovo, but also founded on the view that the international system has, as a result of this hostile act by the Kosovo Albanians, become more unstable, more insecure and more unpredictable. Here's why. Recognizing the unilateral declaration of Kosovo's independence from Serbia legitimizes the doctrine of imposing solutions to ethnic conflicts. It legitimizes the act of unilateral secession by a provincial or other non-state actor. It transforms the right to self-determination into an avowed right to independence. It legitimizes the forced partition of internationally recognized, sovereign states. It violates the commitment to the peaceful and consensual resolution of disputes in Europe. It supplies any ethnic or religious group that has a grievance against its capital with a playbook on how to achieve its ends. It even resurrects the discredited cold-war doctrine of limited sovereignty. A historical injustice is being imposed on a European country that has overcome more obstacles since we democratically overthrew Slobodan Milosevic in October 2000 than most other nations have in a much longer time. Recognizing Kosovo means saying, in effect, that Serbian democracy must be punished because a tyrant – one who committed heinous deeds against the Kosovo Albanians in the 1990s – was left unpunished. Such misplaced revenge may make some feel better, but it will make the international system feel much worse. To act out of a false moral imperative to right a supposed historical wrong will contribute neither to international security nor to the region's prospects of European Union membership. It is time to take a step back and examine the damage done. If we can find a creative way to step back from the abyss that is Kosovo's unilateral declaration of independence, we could not only salvage the credibility of the international system, but even strengthen it through a re-commitment to its basic principles. Some will say that it's too late to put the genie back in the bottle. I don't believe that's true, because it's never too late to forge a prosperous future for all stakeholders to share. What is absolutely certain is that trust needs to be rebuilt and values must be reaffirmed. The way forward lies in coming together and securing an agreement between the two parties: a negotiated, compromise solution to Kosovo's future status that addresses the legitimate right to broad self-governance for Kosovo's Albanians, while preserving a democratic Serbia that is whole and free, integrated into Europe, and engaged with a world set aright through prudent statecraft. The legitimacy of the international system hangs in the balance. 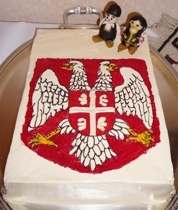 Serbia celebrated its National day on February 15, at the Embassy's premises in Tokyo. 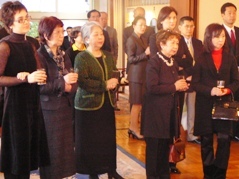 Over four hundred distinguished guests from Japanese political, business, academic, cultural circles and media, foreign diplomatic missions and Serbian expatriate community were present at the Embassy"s reception. 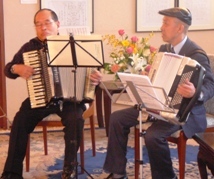 The guests enjoyed Serbian traditional music, performed by the Japanese guitarist Mr. Shimodate, as well as national dishes, wines and spirits. At the invitation of the Government of Japan, State Secretary dr Goran Petkovic participated in the Workshop on Tourism Promotion in the countries of Southeastern Europe. The official host was Mr. Etsuro Honda, Deputy Director General, European Affairs Bureau, Ministry of Foreign Affairs of Japan. This was the third such meeting. The previous workshops were held in Becici (Montenegro) and Sarajevo (Bosnia). This conference was attended by officials from nine countries (Bosnia, Bulgaria, Croatia, Macedonia, Moldova, Montenegro, Romania, Serbia and the Ukraine) and their diplomatic representatives stationed in Tokyo. Mr. Etsuro Honda reconfirmed continuing support of the Governmnent of Japan to the development of tourism in the countries of this region. He also said that mutual cooperation in tourism promotion is an important component of Japan's bilateral relations with these countries. Japanese participants were experts from the Japan Association of Travel Agents (JATA), Overseas Tour Operators Association of Japan (OTOA), Japan International Cooperation Agency (JICA) and various travel agencies. According to the preliminary data of the Republican Electoral Commission, turnout in the 2nd round of presidential elections in Serbia, held on February 3, 2008, was 67.6% (record high). Candidate of the Democratic party Boris Tadic won 50.57% (approximately 2.257.105 votes) and candidate of the Serbian Radical Party Tomislav Nikolic 47.71% (approximately 2.129.403 votes). Final results will be declared on February 7, 2008. By voting for Boris Tadic, citizens of Serbia opted for the acceleration of Serbia's accession to the European integration processes. Two Serbian specialists from Clinical Center of Serbia, Prof. Dr Miodrag Ostojić and Prof. Dr Milan Nedeljković, participated at this year's International Congress "CCT 2008 Complex Catheter Therapeutics (31.01. - 02.02.)". Dr. Ostojić, President of Cardiology Society of Serbia, Member of Serbian Academy of Sciences and Arts and Head of Department of Cardiology, gave a presentation at Congress in Kobe, sharing his experiences in cardiovascular treatment in Serbia. Their participation at this congress contributes greatly to strengtening of medical cooperation with Japanese and other countries' colleagues in the field of cardiology. At the 29th Yomiuri International Cartoon Contest, two out of five Special Overseas Junior Prizes, selected from almost 3000 participants in the junior category from all over the world, have been extended to Serbia. Serbian participants Arsen Lalić (15) and Uroš Maksimović (11) won Special Overseas Junior Prizes for their entries in this prestigeous, one of the biggest cartoon contests in the world. 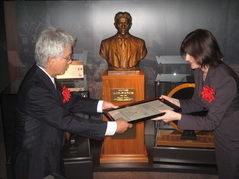 A ceremony of confering the prizes was held at the Yomiuri Shimbun Headquarters, in the presence of H.I.H. 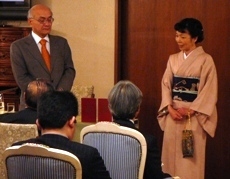 Princess Takamado, executives of the Yomiuri Shimbun, representatives of the diplomatic corps and media. Mrs. Snežana Janković, Counselor of the Embassy of Serbia in Tokyo, received the letters of commendation on behalf of the prizewinners. On January 24, 2008, Japanese translation of "The Light of Microcosm", one of the most famous literary works written in 1845 by Petar II Petrović Njegoš, was promoted at the Embassy of Serbia in Tokyo. 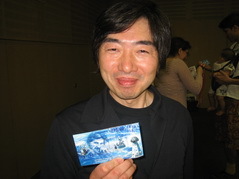 "The Light of Microcosm" has been jointly translated by Professor Kazuo Tanaka, who passed away on March 9, 2007, and Professor Hiroshi Yamasaki, who completed the translation. 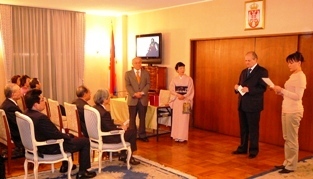 Ambassador of Serbia Ivan Mrkić and Mrs. Chizuko Tanaka, widow of Professor Tanaka, greeted the guests. Explaining the place that this philosophic work of extraordinary value and beauty occupies in Serbian literature, Ambassador stressed the importance of its Japanese translation for further promotion of Serbian culture in Japan. Professor Hiroshi Yamasaki delivered an interesting lecture about the process of translating "The Light of Microcosm" into the Japanese language, expressing his and Professor Tanaka"s views on Njegoš"s literature. 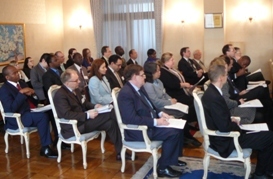 More than fifty guests from academic circles, media, as well as friends of Serbia were present. Among other dignitaries, the Honorable Mr. Satsuki Eda, President of the House of Councilors of the National Diet of Japan, attended the gathering. On January 22nd, Embassy of the Republic of Serbia hosted Tokyo Consular and Administrative Corps" (TCAC) seminar on the Japanese Labor Law. 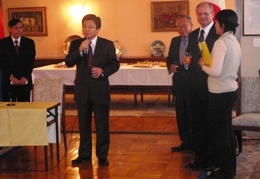 On this occasion, Mr. Kunio Miyazato, President of Labour Lawyers Association of Japan and a member of the Tokyo Bar Association, delivered a lecture, while Embassy's representative Mrs. Snežana Janković welcomed the attendants and Ms. Laurie Trost, President of TCAC, made introductory remarks. This seminar provided an excellent opportunity to discuss labor issues. 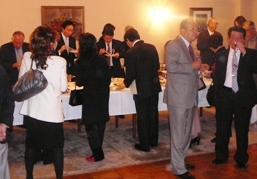 Attendants, more than 40 representatives of diplomatic community in Tokyo, also enjoyed some traditional Serbian food and drinks. On January 16, West Japan Folkdance Association, with the support of our Embassy, organized public lecture about culture and history of Serbia in Fukuyama City, Hiroshima Prefecture. 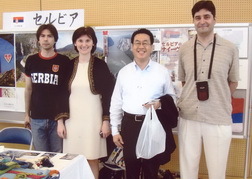 The lecturer and the president of the Association, Mr. Yoshiaki Oka, used the opportunity to distribute some tourist pamphlets and information about our country and arrange a Serbian language workshop. This event is part of the activities f Association, promoting their project of bringing folklore dance group from Serbian city of Loznica "Karadžić" to perform at the "Rose Festival" in Fukuyama City in May. West Japan Folkdance Association has been nurturing close relationship with Serbian folklore dance group for some time now, and in 2005. they invited Mr. Miodrag Spernjak, coreographer, who held a very succesful Serbian traditional dance workshop in Fukuyama city. 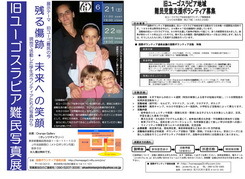 The articles about this lecture could be read here (available only in Japanese).